Norma Jean Mattei, Ph.D., P.E., F.SEI., M.ASCE, and Thomas R. Walther, P.E., F.ASCE, have been selected by the Board of Direction’s Nominating Committee as the 2 official nominees for the position of ASCE president-elect. 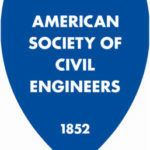 ASCE’s election, which will also include Region directors and governors, begins on May 1 and closes on June 1. This year marks the first time the election will be conducted exclusively electronically; paper ballots will no longer be sent to the membership. Mattei, professor and past chair at the University of New Orleans Department of Civil and Environmental Engineering and past interim dean of the university’s College of Engineering, was appointed by President Barack Obama in 2012 to serve a 9-year term as one of 3 civilian commissioners on the Mississippi River Committee (MRC), which advises Congress and the Administration on matters pertaining to the watershed from its headwaters in Minnesota to the Louisiana delta. A graduate of Tulane University, Mattei also had the honor of being appointed by Louisiana Governor Kathleen Blanco in 2007 to serve a 6-year term on the Louisiana Licensing Board for Professional Engineers and Land Surveyors (LAPELS). As a member of LAPELS, she served as chair, secretary, and on the Executive Committee. 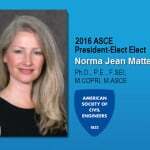 Actively involved in ASCE at the national, local, and state level since 1997, Mattei has a long and distinguished service, serving nationally on the Society’s Executive Committee (2011), as Region 5 director (2009-2011), as chair of the Region 5 Board of Governors (2009-2011), as a member of the Region 5 Board of Governors (2006-2011), as secretary of the Region 5 Board of Governors (2007), and as vice-chair of the Region 5 Board of Governors (2008). A member of the ASCE Foundation Council of Trustees, she also was president, secretary/treasurer, and director of the Louisiana Section Board and delegate to the District 14 Council. Locally, Mattei was president, vice-president, treasurer, and director on the New Orleans Branch Board. A member of various ASCE committees, Mattei has served on the Committee on America’s Infrastructure, the Engineering Education Committee, the Program and Finance Committee, the Committee on Licensure, the Leader Training Committee, the Program and Finance Committee, the Audit Committee, the Task Committee on Region-Student Relations, the Policy Review Committee, and the Committee on Licensure and Ethics. She also volunteered on numerous activities, such as spearheading the ASCE Kid’s Area Civil Engineering activity at the New Orleans Jazzfest (1999-2012) and being a judge at the Greater New Orleans Engineering & Science Fair (1996-present). 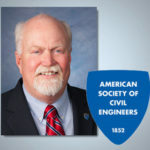 A utilities coordination engineer with the Eau Claire, Wisconsin, office of Ayres Associates, Walther has spent his entire career in public works engineering. Working 9 years with the Iowa Department of Transportation and the following 25 years as highway commissioner of Eau Claire County, he had oversight of the regional airport, managed the county landfill, and currently manages operation of the county highway department. In addition, Walther managed all operations of the county highway department, covering all work on county highways, all maintenance work on State highways, and contract work for various local governmental units. An ASCE Fellow since 1996, a Life Member since 2013, and charter member of the University of Wisconsin-Platteville Student Chapter in 1967, Walther has held every office within the Wisconsin Section Northwest Branch. Recipient of the Wisconsin Section Engineer in Government Service Award (1998) and the Wisconsin Section Distinguished Service Award (2008), he has served on the Section’s Board of Directors with terms as Section president, branch director, director at Large, vice-president, chair of the History and Heritage Committee, Section Report Card Committee, Section Awards Committee, Section Nominating Committee, and Spring Technical Conference Planning Committee. On the national level, Walther has served as District 8 director (2004-2006), chair of the Region 3 Formation Team (2005), Region 3 director (2007-2009), chair of the Region 3 Board of Governors (2006-2009), and member of the At-Large Director Review Subcommittee (2008). Walther says the first step is to guide and lead the Board and the Society in implementing current Board strategies, plus developing updated strategies to move the Society forward. Walther envisions the second step as enhancing and maximizing service to its members. “With today’s technology ASCE should be able to better show its members what the Board, Board Committees, Institutes, and other organizational entities are doing,” writes Walther. “I will strive to have summarized minutes of the above entities readily available on a members-only sector of the ASCE website. I firmly believe this will allow members to better comprehend what the Society is doing for them and with their dues money. 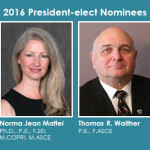 Complete biographies and vision statements for Mattei and Walther are now available, along with general election information on ASCE’s election page.